Katie Still organised a trip here in 2015. John Kenny really wants to go here so, if he’s free, you’ve an enthusiastic AD on board already! Sources of information: http://diving.ie/wicklow-head/ (CFT website) and http://www.inyourfootsteps.com/sailing/harbours/europe/ireland/wicklow/48/wicklow_harbour (in your footsteps website for Harbour info). 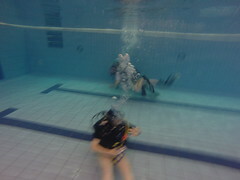 Ocean Diver depths around the head, very shallow. Tide: The tide at the headland runs 2 hours before the harbour, so if LW is at 10am at the harbour, it’s at 8am at the head. The head is very tidal and the local club dive always in the lee of the tide, (flood runs north, ebb runs south). They don’t calculate slack as such, because the headland protrudes the furthest East of any point in the Republic of Ireland they dive in the shelter of where the tide is running. So e.g. we dived on the north side of the head because the tide was flooding north, so we had some shelter from it behind the headland. Because it’s so tidal DSMBs are of course a must. It’s recommended to only dive here on Neaps. Wicklow Sailing Club 040467526 (they were really helpful and had a member meet us at a time we asked for to leave our trailers in their boatyard right by the slip). 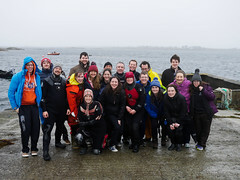 Wicklow Dive Club (contacted via CFT website on email wicklow@diving.ie) were unbelievably lovely and helpful! I can’t emphasise enough how much help they were, and how welcoming and generous! Countless questions were expertly answered by their lovely DO Philip and on the day- even though they weren’t diving- several of their club members met us at their clubhouse in the marina and offered us use of their changing rooms, compressor, showers, bathroom and gave a site brief- they even brought their boat out with ours and showed us the areas they usually dive! Amazing! A nice 1 hour journey from Flynn rooms, it’s really handy. We stayed in our own homes in Dublin and drove down, but of course there are options to stay in Wicklow town if you wanted to. There is lots of parking at Wicklow harbour which is free on Sundays but works out quite expensive (1.20 per hour) between 9-6 Mon-Sat so try to bring lots of coins! Lots of amenities (nice pubs, shops, atms etc.) in Wicklow town. Compressing: we were planning to go back to Flynn rooms to compress as it’s less than 1hr away but Wicklow dive club also offered us use of their compressors so that is another possibility. We launched at the public (free) slip by the sailing club on the East Pier which we were told gets tricky at LW. We launched at roughly 1.5hrs before LW and it was fine (on neaps). There is another slip on the west pier that is good at any stage of the tide but unfortunately the council had closed it (put some boulders in front of it) when we were there (in 2015), so maybe worth checking that again when you plan your trip there in case it’s reopened and you need to launch at LW. I’d recommend that you park and dive there too (instead of the West Pier), because the east side has nice stairs for loading boats and more places to tie up etc. plus a nice RNLI lifeboat station! Mooring: Brida (the Harbour Ward) or Capt. John Barlow (the Harbour Master) on +353 404 67455 (Mon-Fri 9-5) about mooring the boats overnight there, it cost €15 per boat in 2015. On leaving the harbour keep well clear of the “Black Castle” turning South because there are lots of rocks close to the surface and steer for Brides Head (the first headland you’ll see). Keep at least 50m off Brides head while rounding it. Wicklow head is next point with the 3 lighthouses to indicate you’re at the right place. Keep a keen eye out for lobster pots and buoys as there are plenty. Also, if you dive on Carraigwee (site furthest South from the harbour), there are a couple of rocks underwater to avoid. The harbour is a mile and a half northwest of Wicklow Head. Wicklow Harbour offers complete protection for boats. In strong northeasterly to easterly winds a heavy swell develops in the outer harbour but a vessel can proceed upriver for further protection. The harbour offers secure access day or night, on any tide in all reasonable conditions. N.B. 4 knot speed limit in the harbour. The headland is very sheltered to winds from the south (on the N side) but very exposed to winds from the N and E. Because of its proximity to Brittas Bay the vis can be awful after windy conditions. Before launching apparently it’s worth checking along the coast road to the lighthouse looking at the conditions. Emergency number: 087 9729366 (24/7); or non-emergency number: 01 8733044. Wicklow District Hospital: Glenside Park, Wicklow Town, +353 404 67108. Nearest defibrillator: RNLI station has one or the Wicklow hospital. Water Supply: On Packet Pier and North Pier only. Sites were all less than 10mts that we did, but there were some cool sounding overhangs, boulder swim-throughs and caverns that would be lovely in better viz (we had probably less than 1m so didn’t attempt these!). Most of us also encountered some playful/terrifying seals underwater. A few nips here and there but most of us returned with our fingers, if not our dignity, still intact. Description: A dive is possible here on any tidal state. Descending close to the rock face it is quite shallow, with a lot of gullies which make for an interesting dive. There are normally a number of seals around. The rock formations give way, at 10m, to a flat sandy bottom. Numerous fish are to be found including wrasse, dogfish, Pollack and flatfish, with the usual assortment of crabs, lobsters and other shellfish. **On the north side a boat can (potentially) tie on to the little quay which was used by the Commissioners of Irish Lights. Description: A tunnel runs through the rock for 15m and apparently normally has a few seals in residence. Enter the water close to the “Landing Steps” and head out to sea along the reef. The kelp bed ends at 10m and the bottom continues to 15m. Alternatively, go through the cave and return back into the pond by rounding the point. Besides the cave there’s a kelp bed in 10 meters of water, plus a reef (hopefully) covered in shellfish and crawling with crabs and lobsters. Possibly some congers here and other fishy fish. Never dive at this spot when the tide is running south (i.e. ebbing H to L) because the cave acts like a funnel with everything being sucked in and spat out the other side with quite spectacular results. Dived in the right condition it is highly recommended. Description: Known as the Gull Rock because of the number of nesting seagulls. It opens into a sheltered bay area with a flat sandy bottom. The further out to sea the greater the effect of the tidal current. Normally there are a lot of dogfish and sand dabs. Reef starts at the steps. Description: Named Carraigwee because of the lichens which give the rocks a yellow colour, this is the deepest point at the head, with depths of 20m at high tide. Descend at the rock face and proceed along the bottom keeping the reef on your left side. Underwater, the reef heads almost due south, N.B. the further out the greater the tidal effect. This is apparently a very good dive with the reef being home for many creatures including large conger eels. It is again important to note diving in Carraigwee should only be undertaken when the tide is running south. 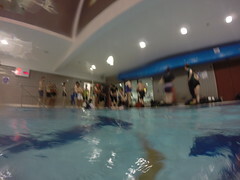 Description: This should only be attempted 2 hours either side of slack water and when weather conditions are ideal. It is also not suitable for novice divers. SMBs of course essential from the start. The drift dive can be an exhilarating experience and requires little effort. The bottom rises and falls as you’re being swept along with each glance revealing something new. The bottom has been swept clean of weed but does have an array of shellfish including mussels, whelk and winkles. There is a substantial amount of the wreck left with a lot of the equipment visible, boilers and super structure. The wreck is full of sea life and has a spare Iron propeller on the deck. The wreck is littered with strings of storm damaged lobster pots with large Conger living throughout the wreck but especially under the boilers.